Ontario contains a variety of roadway types to help goods and people move in and through the City. Ontario’s roadway system must meet multiple goals. It must provide convenient access and be safe, free flowing, visually appealing, multifunctional and in context with its surroundings. The roadway system should be designed to provide the necessary capacity to accommodate the traffic generated from the future buildout of the Land Use Plan while maintaining Level of Service standards. The street right-of-ways also need to accommodate pedestrians, bicyclists, landscaping, traffic control devices, and infrastructure in a manner that is safe and aesthetically pleasing. The Functional Roadway Classification Plan shows the hierarchy of our roadway system, consistent with the guidelines of the Federal Highway Administration. 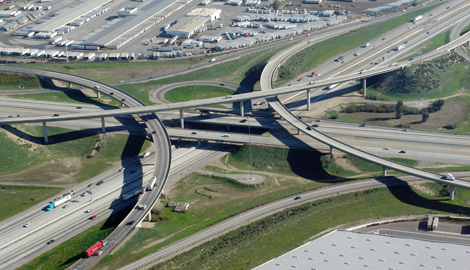 A system of roadways that meets the mobility needs of a dynamic and prosperous Ontario. Comply with federal, state and local design and safety standards. Handle the capacity envisioned in the Functional Roadway Classification Plan. Maintain a peak hour Level of Service (LOS) E or better at all intersections. Be maintained in accordance with best practices and our Right-of-Way Management Plan. Mitigation of Impacts. We require development to mitigate its traffic impacts. Roadway Improvements. We work with Caltrans, SANBAG and others to identify, fund and implement needed improvements to roadways identified in the Functional Roadway Classification Plan. Adjacent Jurisdictions. We work with neighboring jurisdictions to meet our level of service standards at the City limits. Complete Streets. We work to provide a balanced context sensitive, multimodal transportation network that meets the needs of all users of streets, roads, and highways, including motorists, pedestrians, bicyclists, children, persons with disabilities, seniors, movers of commercial goods and users of public transportation.